Discussion in 'Maiden Chat' started by Black Wizard, Nov 13, 2017. Most shows go on sale Friday 24th November. As always, there will be an exclusive presale for Fan Club members, starting Monday 20th. Full on-sale and pre-sale details will be added shortly. We're all going to Plovdiv! breeg and Perun like this. Tempting to do Tallinn, Helsinki, Stockholm and Trondheim. Sounds very 80's heavy, which is a bit disappointing but expected I guess. Hopefully a few surprises. Should be a cool stage set however. Only four back-to-back gigs the entire schedule. Altough I'm expecting a second London date to be added. The artwork have got the Scottish flag (Clansman?) and what seems like a mosquito (Lord of the Flies?) right next to it though. But yes, I expect typical 80's classics. Which, to be honest, is dull. Maiden4Ever, Lego and Murder89 like this. ...with a set list covering a large selection of Eighties material with a handful of surprises from later albums to add diversity. So another 80's nostalgia trip then. Alright, I'll take a pass on it. Depending on the songs to be honest. 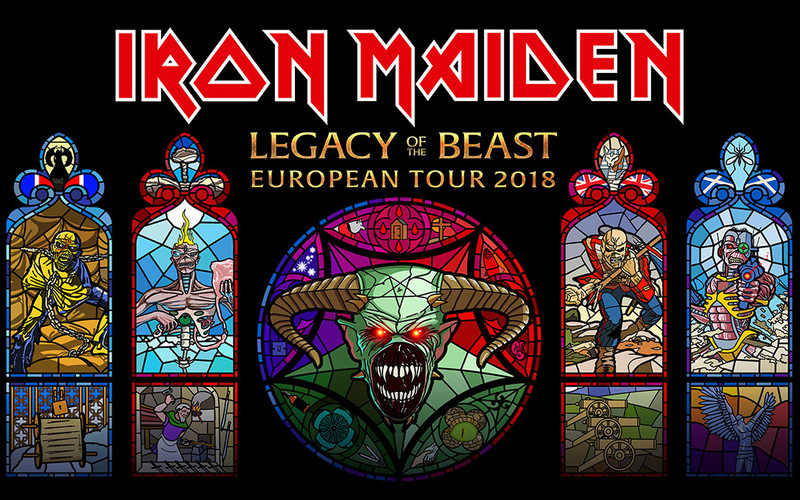 I'm expecting at least two surprises a la Children of the Damned and Powerslave on the last tour. Guests on other shows are currently being finalized and will be announced soon. That could be Priest and Anthrax. Zagreb and Trieste for me. Guys, don't be so quick in assuming that it will only be the Trooper/NOTB/Two Minutes to Midnight routine. I'm not ruling out that they will dust off some deep cuts, say, Flight of Icarus or Die With Your Boots On. terrell39, GhostofCain, PieceofMind89 and 1 other person like this. Trondheim is actually a two-day festival. Volbeat is playing, as well as some other groups. Norwegian band Hellbillies is also playing, I think they have some good songs but it's hilarious that they are doing the same festival as Maiden. That's like.... I don't know. So glad they are returning to Greece after 7 long years! They've been missed! 22 Acacia Avenue. You heard it here first. Deep cuts...TO TAME A LAND for me. terrell39 and Zare like this. Belfast and Hellfest for me. It's... underwhelming. Legacy of the Beast - never liked the idea of a tour based around a mobile game. Thought it's unlikely but I was wrong. I don't like the art direction of the game so I'm curious if the production of the show will be similar. The "eighties material" part is the most disappointing. Seriously? So much talking about how Maiden is all about here and now and this is the third 80s-centric tour between albums in a row. Oh, well. This is a good opportunity to redeem themselves and play Infinite Dreams this time. And debut Alexander. If they won't include like 5 deep cuts, then it's gonna be really dull. Murder89 and Lego like this. 22AA, Flight of Icarus and SIASL would probably be a pretty satisfactory score for 80s deep cuts. The problem is, none of those are particularly likely (although 22AA probably has the best shot, with SIASL a distant second) and it seems the "surprises" of the set are angled towards the reunion era stuff. So, probably FTGGOG and a couple of other less common modern era tunes, with the usual 80s classics. It's not terrible or anything, but it's kind of a boring concept if you ask me. So that times perfectly for recording a new album late winter/early spring and releasing it next fall prior to the next leg of the tour? Eh. Knowing them, they would have had to start writing by now for this to happen.